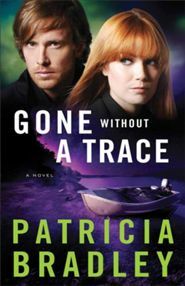 Gone Without a Trace is a nail biter suspense that will keep you enthralled from page one. This is the first of Patricia Bradley’s books that I’ve read and I’m hooked!! I’ve already added the rest of her books to my must read pile! In this book, mystery and suspense rule the storyline and there’s not a dull moment in between. I especially loved the transformation of Robyn’s character and the way she fought to maintain courage to overcome her personal struggles. There’s so much to tell you but I don’t want to spoil one second of the book. Suffice it to say, this is a must read!! I could not put Gone Without a Trace down. Although it’s the third in the Logan Point Series, it can easily be read as a stand alone. I had not read the first two books and I was still able to follow the storyline easily. I loved that Ms. Bradley gave enough history to catch me up but not enough to bog down the storyline. I was given this book by Revell for the blog tour in exchange for my honest opinion which I’ve provided here. Thank you so much for your review! Made my day!